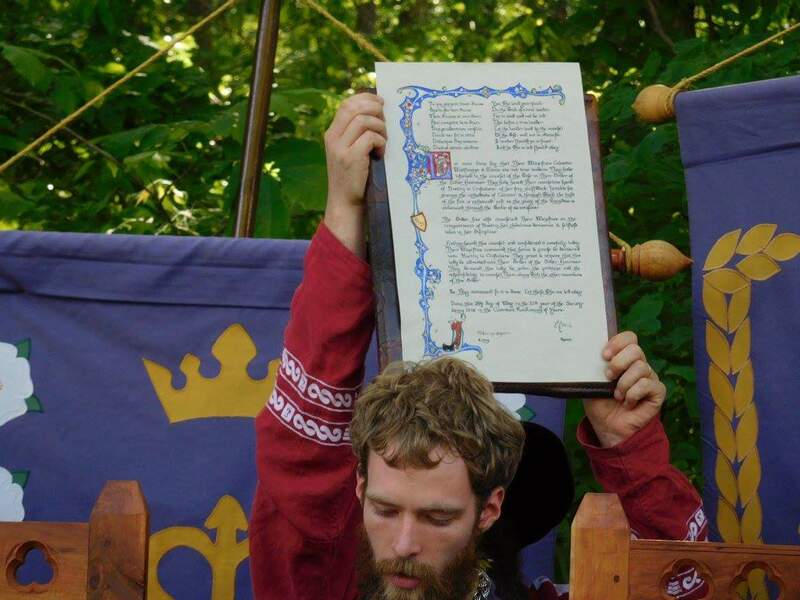 I was honored and excited to do a late German scroll recently. Excited for the opportunity to create cadels, as many late period German texts have. After receiving the text, I researched legal illuminated German works from the 15th century and calligraphy cadel images. I had my plan and did the layout. I then lettered the text body. I selected the versal and additional letters I wanted to embellish with cadels. I made pencil sketches of the letter in a size that would fit the text's planned space. I then worked up a few. Unfortunately, the sketches don't scan with enough contrast to show here. I worked this up as I described above and liked it. Using my light pad, I transferred the cadel outline bones to the scroll with a hard pencil. Then I used a #2 Mitchel dip pen nib to letter the lines and broadest cadel parts turning the pen to make the thinnest lines. I added details with a smaller nib. Versal with cadel on scroll. 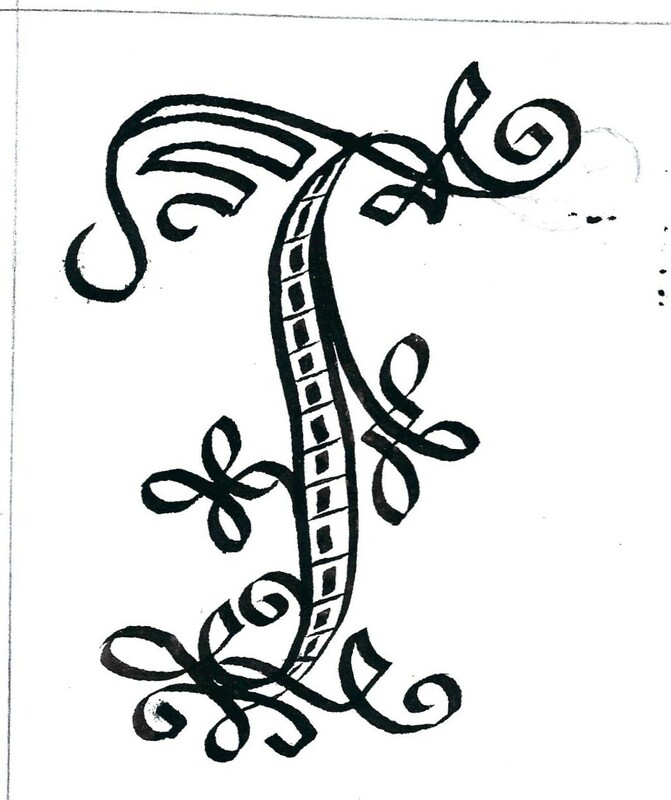 The example I chose had red filigree. 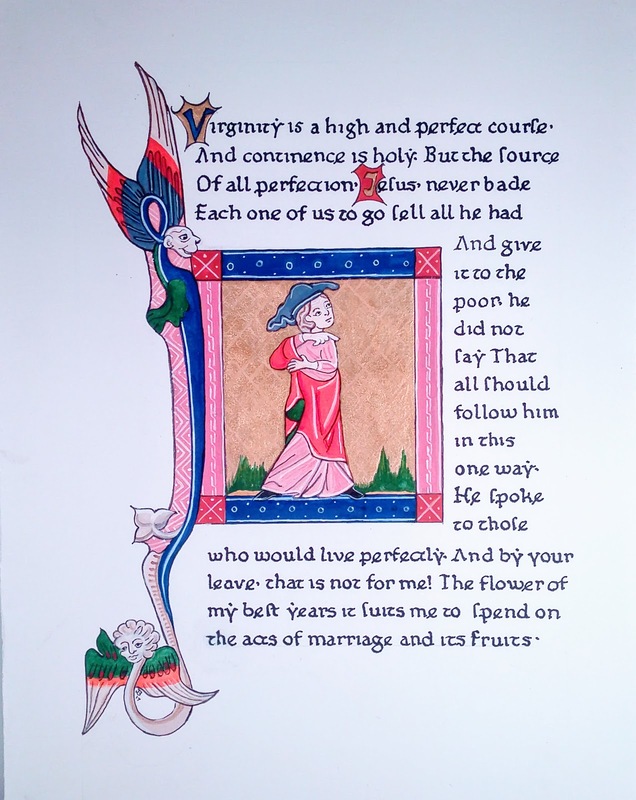 For this scroll, I substituted gold Pearl EX bound with gum Arabic for the red because this is a peerage award. The request was to keep costs low so I did not use the pricer shell gold. The award won't be given until Lilies War, so I can't show my finished work until after then. Please check back later. The Pensive Pen's Method beautiful scroll. Why Is Scribal Art Under Appreciated? Dollars to donuts the scribe is the least appreciated SCA artisan. That doesn't mean the person receiving the award doesn't appreciate receiving it and its kudos. But many recipients do not understand or appreciate the work done by the scribe. Sometimes when a scroll leaves the scribe's hands and is given in court it's never seen again. Depending on the award's type or level it may go into a file or binder rather than displayed. People in the SCA will seldom see that piece of art again. Why do so few people appreciate the time, effort, and creativity a scribe puts into their work? Where is the motivation for excellence if the recipient doesn't treasure it? People don't know the time that goes into a scribe's learning and scroll production. It’s more time-consuming, complex, and costly than you think. Award Scrolls are original pieces of art, that take many hours of work and the supplies and skills to make them. Even a Calontir predesigned preprint scroll takes 10 hours or so. Using the federal minimum wage of $7.25 per hour makes just the labor for the painting of that 8"x10" award worth $72.50. A more elegant scroll, created by an experienced scribe with high-quality materials could be considered as being done by a fine artist. They receive an average of $20 per hour, according to Payscale.com. That same size scroll now would cost $200 in labor, and go up from there depending on the size and execution time. There's more to a scroll creation than effort and supplies. There's love. Most scribes crave the creative experience, experimentation, education and exploration. They are captivated by each pen mark or brush stroke. They don't understand why non-scribes don't have the same interest and drive for their inspiration. Scribes also enjoy serving their Kingdom and scribal community. It's a way to give back to what brings them joy. It's recognition to have a scroll shown high in court and have the calligrapher, illuminator, and wordsmith's names read. For that to happen you, the scribe, must put your name on the scroll's back and possibly your email address too. It makes it easier to recognize your work when you sign the back than if you include a simple maker's mark within the illumination. Sadly, it’s rare when a scribe receives a thank you. I am pleased to have received a few thank you cards and even a small gift of vellum once. Next time you receive an award scroll, remember it’s a gift of time and love as well as beauty. It is a quiet art, done at home, and given away. Sometimes we scribes have to learn to pat ourselves on the back and be our own advocates. Tell your friends when they see a scroll the effort it took to make. I had changes in my life two years ago so I drifted away from creating scrolls. Then M. Elynor of Glastonbury asked me to teach my paint making class. 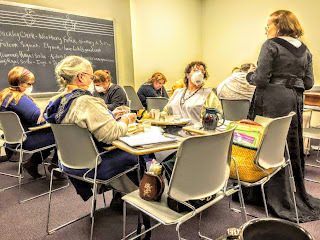 That sparked my interest and return to scribal art and teaching it. 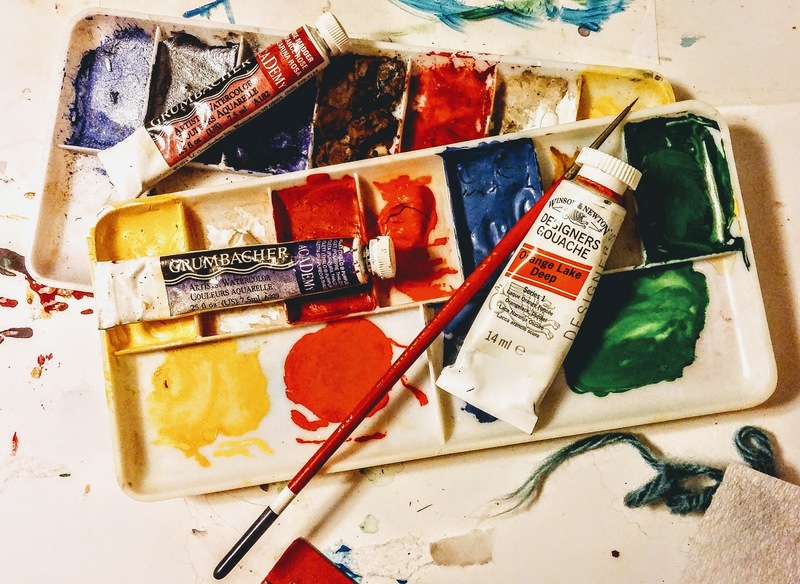 I've learned a few things returning from my scribal pause and thought they might interest you. Experimenting with materials and techniques both new and old is intriguing. I'd forgotten how much I enjoy and missed learning and testing things scribal. Revisiting this has given me new awareness and inspiration. I'm more consistent about scanning and photographing my work. I make notes on materials, techniques and process for this blog. But this helps me learn and be more aware of my efforts. I now place my palette and water as close as possible to my work. When doing numerous tiny strokes this controls blobs or splashes. It's a time and motion thing I learned as a hygienist. Supplies don't last forever. - Duh- Since my return I found warn, bent, or separated tines on some nibs. An ink separated, and even when I shook it well it feathered on the page. Long dried pallet paint didn't reconstitute. A quality scroll is influenced by quality materials and tools, so I've gradually replenished my stash. I also use a yeti-type covered beverage vessel to assure I rinse my brushes in water not my tea. You can probably tell from my comments I've made a few missteps and am relearning things. My students are my teachers now. 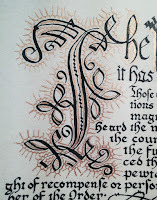 Re-reading a modern calligraphy book, I noticed a comment about the Ramsey Psalter. I thought it was a strange place for the comment and possibly an error. So I went looking. The Ramsey Psalter is now in the British Library. It is an Anglo-Saxon illuminated book including the Book of Psalms and other devotional material. 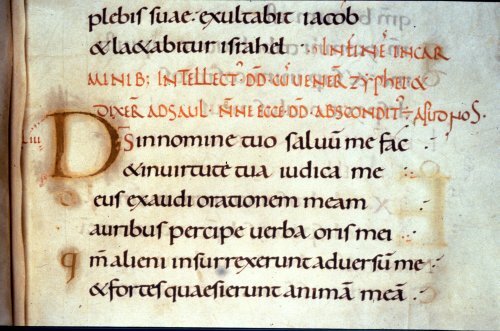 It's script is the elegant English Carolingian or Caroline minuscule used between 800 and 1200 A.D. 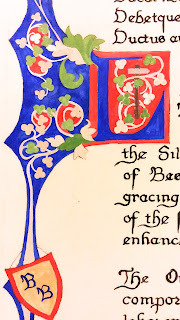 So what does this thousand-year-old illuminated manuscript have to do with modern calligraphy? showing it's Caroline minuscule script. 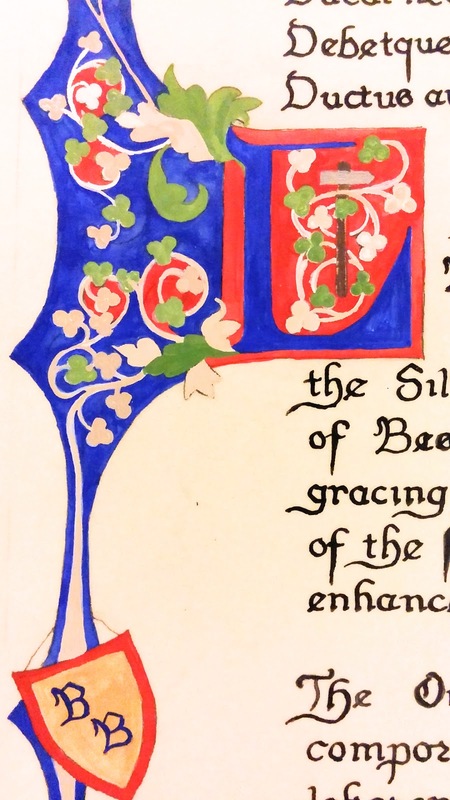 "The script of the Ramsey Psalter formed the basis of Edward Johnston's 'foundational hand' which inspired a renewal in 20th-century calligraphy." 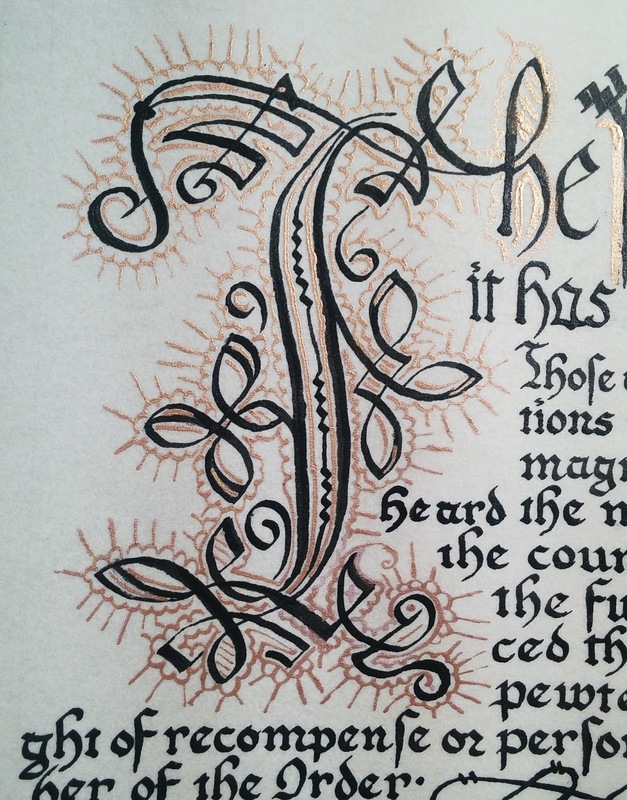 I've noted "Johnston" in other calligraphy books, but never paid attention to the reason. 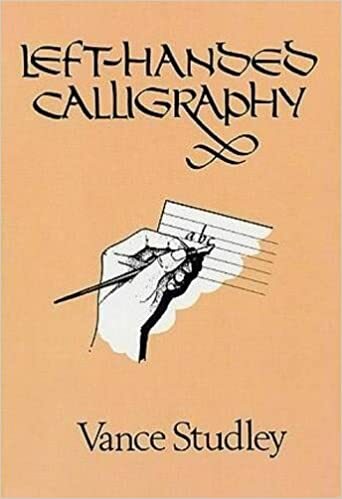 He is often called a "father of modern calligraphy" because he re-instituted the use of the broad-edged pen and developed a modern script useful for it. His teaching and practice revived the formal penmanship art dormant for centuries. His major work Writing and Illuminating, and Lettering, first published in 1906, created new interest and new excellent scribes. 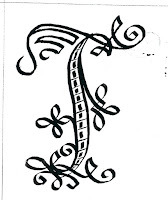 My ductus for early Gothic script. While I'm an SCA trained calligrapher, I've read 'Johnston's Foundational Hand is often the first script a modern beginning calligrapher learns. I see why, with its upright, rounded letter-forms and comfortable 30 degree pen angle. Caroline minuscule or early Gothic, from which Johnston's script came, is a beginner script for many SCA scribes too. From a dusty old Anglo-Saxon manuscript's writing to one person's turn of the 20th century interest, life was breathed again into this ancient skill. It continues today in even our hi-tech world and our SCA scribes. Yesterday I went to my favorite bookstore, Half Price Books. It's so close to home, I've walked to it. I always check out their $2 sale section. This time I found something unique. 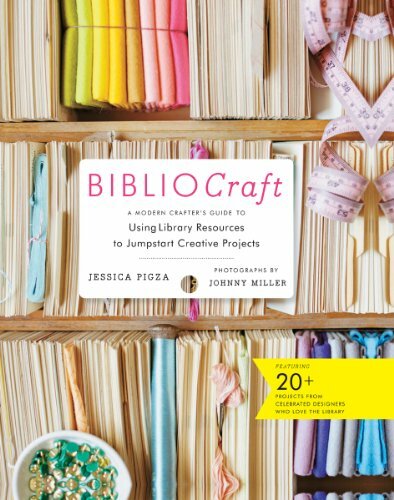 BiblioCraft: A Modern Crafter's Guide to Jumpstart Creative Projects, by Jessica Pigza. I bought it just for giggles, without looking it over. Was I surprised. As a SCAdian and a scribe, I'm well aware there's amazing wealth in libraries. I thought I'd become an expert in searching them and online. This book's author is a librarian and she beats my ability hands down. Pigza's book tells how to develop projects based on library resources, just like we do in the SCA. It's intended for all creatives whether hobbyist or professional, basicly anyone in the SCA. For us Part I may be the most important. In it Pigza tells how to find and use what libraries' have to offer, online or in person. From the library's branch, research, or special collections; to how to find the right library for you; to how to plan a library visit the proper way; and how to search. There's amazing information there. Part II includes 20 projects inspired by library resources. While these projects are not historic recreations, the resource information within them is relevant. 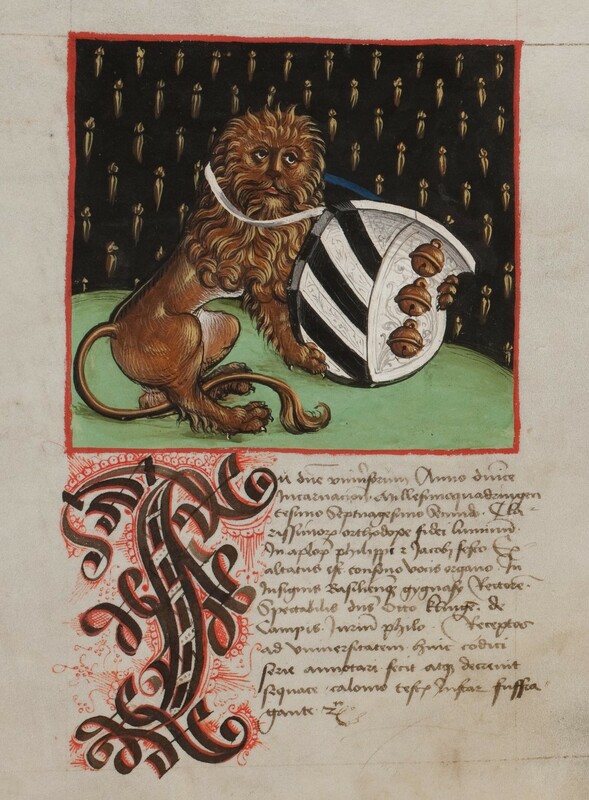 I was excited to read Pigza even includes stuff on illuminated manuscripts, penmanship, the history of type design, bookplates, decorative book bindings and the art of heraldry. Topics a scribe might enjoy. This book is a great way to learn what today's librarians know about libraries and research, in a way normal people can understand. I see it particularly useful for a newcomer or Chatelaine. I can't wait to access the scribal related details. I've shared my creation process online after finishing a scroll. And many seamsters show their work-in-process as it progresses, from early stages to detailed completion. But is it a good idea to post unfinished scroll images online? There are both plusses and minuses to this. Interested people see my work as I progress. Scribal students may learn from the process. Both my challenges and successes are seen as they develop. If the honor has not yet been given I must hide the name, accompanying heraldry and other identifying details. I lose any first impression impact. Unless my process is uniquely intriguing there's no reason viewers can't wait for it. My scroll creation process includes several unphotogenic steps useless for progressive sharing. I bet yours has some too. Importantly, I've found standalone individual images of my unfinished work on Pinterest, and when searching on Google. They could be misinterpreted as poor quality rather than incomplete. Letting people know you're scribal passions, development, and what you're doing is interesting for the community, and maybe to the world. Today, more than ever, it is important to safeguard your work to be seen as a valuable resource. gum Arabic. Done on Bristol board. Recently I had trouble with my Higgins Eternal Black Ink feathering on paper. I thought it was past its use. When I realized I had been working on Bristol board and typing paper, not my usual Pergamenata, I blamed the support. So I did an experiment. I added a little gum Arabic to my 3/4 empty ink bottle. It helped, although I could have added a little more. Next time I'll test it before I use it. The good news is the ink flowed well from my dip pen and didn't turn it funky. This trick will expand my Higgins Eternal Black use. I'll be able to use it on Bristol board and practice papers. Besides controlling my ink's feathering gum Arabic adds a little gloss to ink or paints. I've heard of scribes adding it to their clean paint water to increase gouache's shine. Something I plan to try in the future. While liquid gum Arabic is pricey--about $12--for 75ml you can often buy it on eBay for much less. It lasts a long time. I've had mine years and even diluted it with water when it thickened. Here's a Youtube video showing this trick by ElisaAnne Calligraphy pPublished on Jun 26, 2016. Mixing Gum Arabic With Ink - Calligraphy Tips & Tricks. So much good information can be found on Youtube, although it takes testing to be sure. Make sure you stay safe too. I am not a leftie, so I'm challenged by coaching calligraphy for people who are. Even so, interested left-hand writers want to know what to expect if they try calligraphy. What should a left-handed person learn? Left-handed calligraphers use various writing styles. They approach the text line with their hand from above and below it. They write uphill, horizontally, and downhill with results that vary from a right-handed writer in quality thick-thin stroke results. And often different from other lefties. Most calligraphy books, articles, and Youtube videos only have a small section for lefties. There's only limited published information on how lefties hold the nib to the writing line and the angle required to make a pen stroke. What can you do about that? Where can you go for help? Unless you find a left-handed instructor, most answers will come from within you. Since each calligraphy style has a specific nib-to-writing-line angle that controls its thick-thin stroke production, anyone using a different angle won't make letters appear as intended. Since you approach the page from a different direction than a rightie, you must find your own best writing angle. The way you comfortably hold the pen and its nib to create the appropriate angle for your intended calligraphy style. Also, don't be afraid to change the way you letter from that described for right-handed students by right-handed teachers. Cramping your hand and arm for lengthy periods to get the nib to make the correct angle, as do a few leftie professional calligraphers, is difficult and may be painful for your hand, arm or back. Experiment with changing your paper's position so you have a comfortable proper nib angle for your intended script. Beautiful lettering requires fine, exacting muscle control and memory that is only learned by hours of repetition. That means you have to be dedicated, courageous and willing to experiment and practice to let your skill emerge and attain a successful technique. 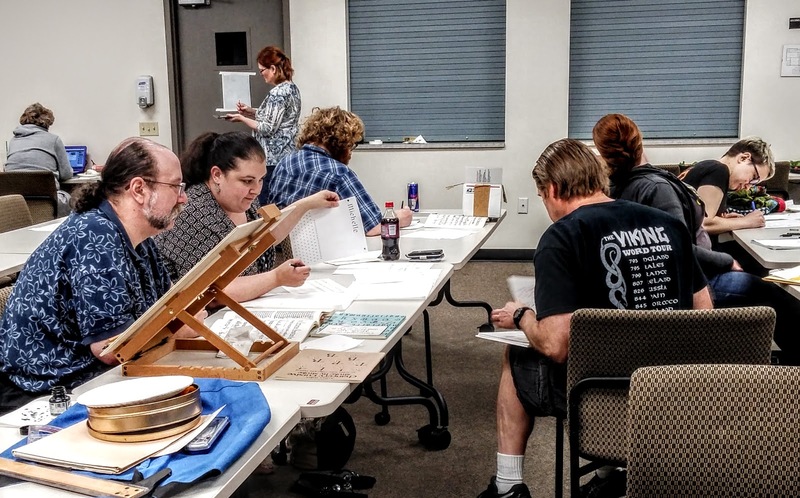 Studley, an award-winning calligrapher and well-known arts educator and author, shows left-handers how to select appropriate tools and materials, learn correct hand, pen and nib positions, master composition and page layout, and much more. 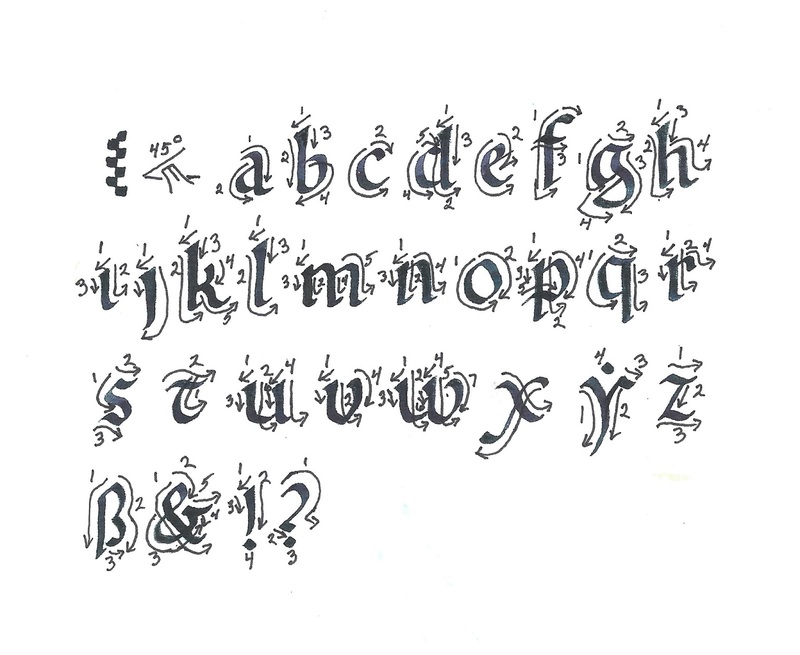 Four model alphabets are introduced — Italic Hand, Chancery Cursive, Uncial Hand, and the Foundation Hand — each providing valuable lessons in the mastery of left-handed calligraphy. The International Association of Master Penmen, Engrossers and Teachers of Handwriting (IAMPETH) has a group of posts about and for left-handed letterers. 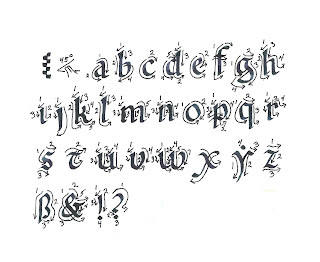 Their information is great for all calligraphy areas, but especially helpful for the leftie. Here are three Youtube videos I found by lefties on left-handed calligraphy. Lefty Calligraphy Published on Jun 9, 2014, by lsbussell, shows the method but there's no narration. Even so, I like this video because it shows a leftie doing broad-pen classic calligraphy. Journey of left handed calligraphy with Klahr on Calligraphy Masters is an interview of a classicly trained working left-handed calligrapher. Published on Aug 12, 2016, Klahr talks not only about his training, materials, and methods. but also his feelings about being a left-handed calligrapher. I did find one training video: Can a Lefty do Calligraphy? narrated and demonstrated by Jacqueline Shuler. Published on Feb 11, 2014. This video shows the pen's placement, its control, and the paper angel. Calligraphy is a skill that involves touch, pressure, hand movement and a concept of beauty. Used harmoniously these lead to beautiful lettering. If you feel your left-handedness bothers your learning, your uncertainty increases over that we all experience when acquiring a new skill. I hope these tips help you overcome uncertainty and you let your skill emerge.